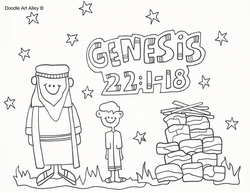 The story of Abraham is found in chapters 11-25 of the book of Genesis. Abraham had a son Isaac and was asked to sacrifice his life as a test from God. At the last minute an angel came and told Abraham he no longer had to kill Isaac.